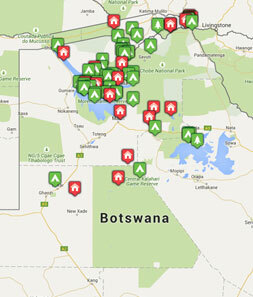 Tribes Overall: "A wonderful introduction to the safari experience." Tribes Service: "Hannah was very patient and accomodating in offering alternative suggestions when we were undecided." A very friendly camp. The staff were great and called us to dinner with a song every evening. The game drives took full advantage of the varied terrain. Food was excellent the guides were friendly and knowledgeable. The rooms were good. The environment beautiful with impala within feet of our tent. The lodge had the atmosphere of a house party and everyone waswelcome. Comfortable tents and interesting en-suite facilities. The journey from Maun included a stop at a cordon sanitaire to disinfect our shoes because of a foot and mouth outbreak. A long drive to the National Park and not within easy reach of the salt pans. The walk with the San is recommended. Very welcoming. Great food. Lovely hot water bottles. We were well looked after and the tents were excellent with comfortable seating good bathroom facilities which will be even better when they put up the extra towel rails. The guides and trackers were excellent although the game was not as good as at Kwara. Nice setting. A nice place to relax after the journey to Botswana. Staff were welcoming. The room was good although there was some work going on behind our chalet in the morning which intruded on our privacy a little. The food was good. Great place to relax at the end of the tour. Very accommodating and attentive staff. Nice grounds to walk around for a stroll which was a noelty after being in the bush. They made every effort to enable guests to enjoy their chosen activities. Plenty of choice of actiities on offer.